Information about Music: Do You Want to Learn the TROMBONE? 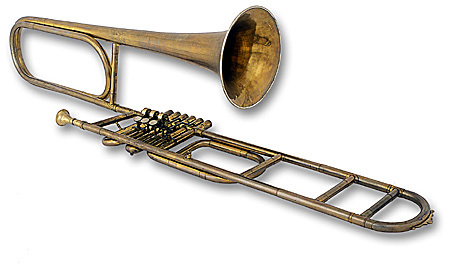 The trombone is a member of the brass family and the horn and come in different sizes. The most common ones are the medium sized or tenor trombone and larger sized or bass trombone which are both pitched in Bb. They produce heavy sounds which are lower than the trumpet and are used when the orchestra is playing loud sections or in harmony with the higher horn and trumpet parts. Trombones have a cylindrical shaped tube and a cup shaped mouthpiece and are related to the trumpets. But instead of valves which a trumpet has, a trombone has a moveable slide which moves in and out. A player will stop the slide at any of the seven positions to get the range of notes available to produce. At any of the positions a series of notes can be produced by tightening or slackening his lips. The notes produced are a series of natural notes called harmonics. When the slide is pulled out completely, the range of notes which can be produced will extend downwards for six semitones. Like other brass instruments, the sound of the trombone is produced by blowing air through pursed lips producing a vibration that creates a standing wave in the instrument. When the player moves the slide out it extends the length of the air column and lowers the pitch. Trombones are played in a variety of situations like orchestras, military bands, jazz bands, dance bands eg the big band.. <br>Orchestras generally have two tenors and one bass trombone. The other groups having varying numbers of trombone players. Let's take a look at two well known trombone players. <br>1. Slide Hampton (Locksley Wellington "Slide" Hampton ) was a famous American trombonist, composer and arranger who played all around Europe after he was in his dad's band, named Hampton's Band. He toured with them a lot and is probably the best role model for starting trombonists. Slide Hampton was born in 1932. 2.Tommy Dorsey ( Thomas Francis Dorsey ) was a great American jazz trombone player as well as a trumpeter, composer, and bandleader of the Big Band era. He had a smooth-toned trombone playing style and was known as "The Sentimental Gentleman of Swing". He is famous for The Spell of the Blues and The Boogie Woogie. Tommy Dorsey was born <br>November 19, 1905 and died November 26, 1956. You now know that the trombone is a brass instrument of varying sizes and can be played in a variety of situations. You have been given examples of two well know trombonists which could look up on YouTube and see if the sound tantalises your taste buds. Then you need to make the final decision; Do you want to learn the trombone?